ENSO Basics: Westerly Wind Bursts Initiate an El Niño | Watts Up With That? October 23, 2013 in ENSO. The ENSO prediction page you point to on the wuwt reference pages always seems to be such a scattergun image that someone somewhere has to be right. ESRL Reanalysis V2 recently extended its Wind data back to 1871 and, perhaps not surprisingly, we find the Trade Wind and ENSO link remains extremely strong throughout that entire period. One other little snippet, it is really the Western Pacific Trade Winds which have the most variability versus the Eastern Pacific. And then, the Western Pacific’s variability is much greater in the winter months. We have sometimes noted the ENSO tends to peak around Christmas and pondered why that is. It is because the Western Trades can be blowing “east or west” around this time while they are mostly to the west in the summer months and the eastern Pacific is almost always mostly to the west. 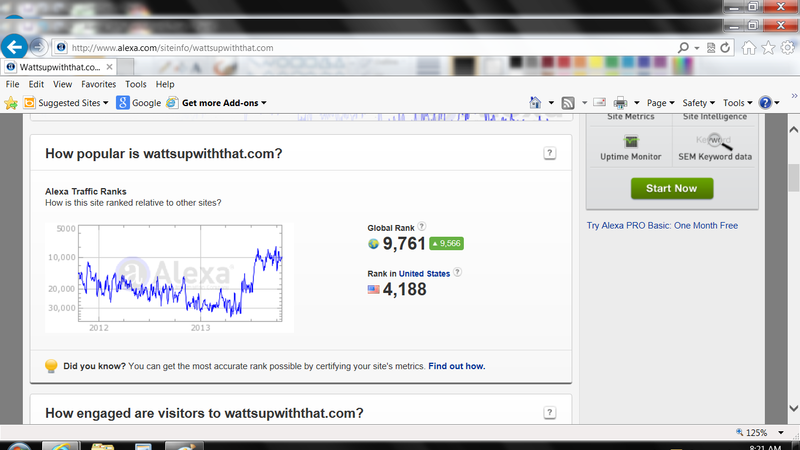 A difficult to read chart but that is what it shows. 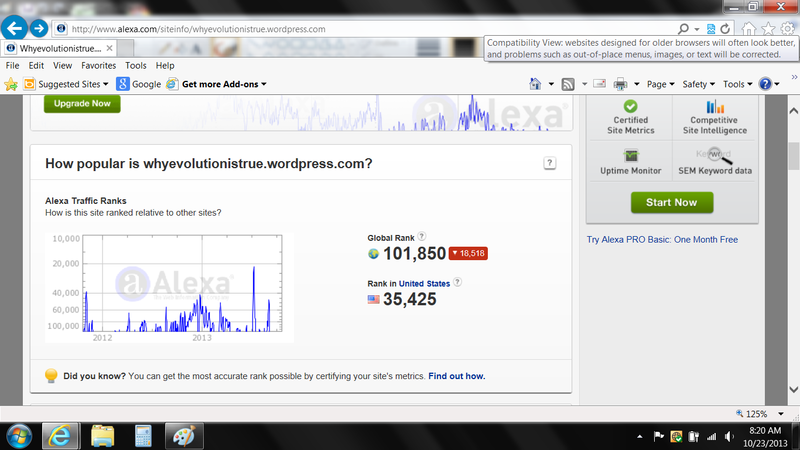 Sorry to be OT but Jerry Coyne at the “Why Evolution is True” website is celebrating being higher in the web ratings than “Watts up with that”, a ‘global warming denial website’ apparently. I like the WEIT website but Jerry doesn’t even seem to be aware that ‘Global Warming’ had to be rebranded as ‘Climate Change’ years ago. Atmospheric CO2 is not the cause of ENSO. ENSO is controlling the rate of accumulation of CO2 in the atmosphere. The emissions from this area are at least ten times all anthropogenic emissions. More seriously from reading this article I didn’t understand which natural process you think is causing the warming? Thanks I’ll take a look. It would seen likely that during an El Nino the rate of upwelling along the coast of the Americas from the deep ocean would be reduced, leading to an increase in surface temps due to reduced cooling. This little (big) clue allows us “under-studies” to recognize when conditions may be changing to El Nino. Bob, I am not qualified to comment on your work, but can comment on the impact of “El Nino” events and the “Southern Oscillation Index” on public opinion in Australia. For years, we were regaled with spiels in every weather report (emanating from the BOM) about the “El Nino”. Now that it has gone, we hear nothing. Same goes for the the SOI. It used to be tremendously important, mentioned every day, but now we hear nothing about it. Bob, if you have a minute, what was it that was so compelling about the SOI? I haven’t studied the relationship, sorry. I seem to recall reading papers about the impacts of ENSO on monsoon winds, not vice versa, but that doesn’t mean there is not a monsoon wind to ENSO-initiation interaction. Johanna, the SOI is one of many indices used to indicate the strength, duration and timing of El Nino and La Nina events. Because El Nino and La Nina events have strong impacts on weather in Australia, it is used by the BOM when those conditions exist. With conditions in the tropical Pacific in the ENSO-neutral mode, the BOM simply doesn’t have a lot to report based on the SOI. ENSO influences the rate of CO2 accumulation: Do you have a source for “The emissions from this area are at least ten times all anthropogenic emissions”? Geez, Bob, are you in competition with Mosher about drive-by cryptic comments? Thanks for nothing. And, if you can’t explain it it plain language, perhaps there is a faint possibility that you can’t, because while the concept of the SOI is thrown about, you consider it beneath your dignity to explain what it means, and why the BOM considered it to be so important. Why would anyone “argue that ENSO can’t create the conditions that help to initiate an El Niño”? Emergent phenomena usually contain short-lived positive feedback loops as initiators. It looks like the answer to the question “what initiates an El Niño?” is “We don’t know”, but at least now we know what it looks like from the top. I have a feeling there is a lot of vertical energy motion that we’re missing by not looking at the vertical motion (This is the realm of Willis’ thermostat hypothesis). I don’t know if anyone has really attempted to actually measure the rate of emmisions, but my calculations on seasonal changes in rates of accumulation at sources (ENSO area) and sinks (Arctic) suggests the global natural source and sink rates are around 20 times the anthropogenic emission rate. The IPPC claims these natural processes balance out and do not change with time and that anthropogenic emissions is the cause of the accumulation in the atmosphere. If you factor out seasonal variations and calculate a twenty-five month running slope to get a net rate of accumulation, you will produce a global signiture for atmospheric CO2 accumulation. This signiture clearly shows the strong el-Ninos with a lag of about six-months. It does not follow the signiture of anthropogenic emissions very well but the long term rates are about the same magnitude. Correlation isn’t cause and effect. The water vapor/CO2 reaction in thunder clouds is the controlling mechnism. Some one try to prove me wrong. And he posts a graphic showing that that was true, for that particular day. Accurate and not at all misleading, if somehwhat trivial. @Stonyground, what do you think the “CC” in “IPCC” stands for, named in 1988? How does JC’s stadium wave signal fit in? johanna: My apologies for not getting more fundamental. SOI stands for Southern Oscillation Index. It represents the sea level pressure difference between Tahiti and Darwin, Australia. Because El Nino and La Nina events are coupled ocean-atmosphere processes, they impact the sea level pressures in both locations. If you’d like further clarification, please be more specific with your next question. Actually, they do good job of diagnosing after the fact as illustrated with the linked papers. But they can’t predict what will initiate one in advance. The stadium waves are multidecadal signals and should not be evident on these timescales. Johanna, let me rephrase my original answer: El Nino and La Nina events can dominate weather patterns in Australia, both temperature and precipitation. The Southern Oscillation Index (SOI) is a metric the BOM uses to determine whether the tropical Pacific is in an El Nino or a La Nina state. They attempt to predict your local weather depending on whether the SOI indicates the ENSO event is strengthening or weakening, which in turn impacts weather in Australia. 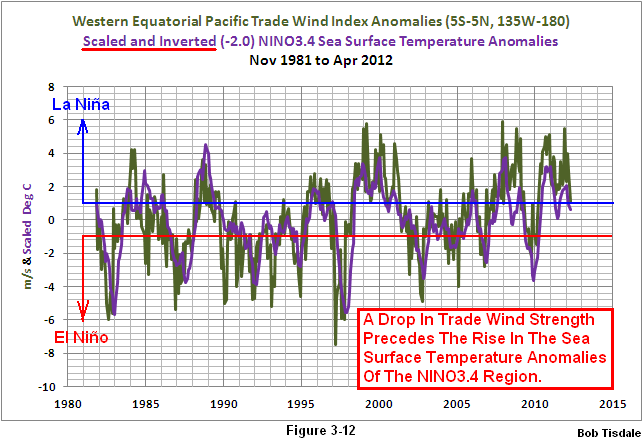 Been saying for years that the key indicator to el Nino is to watch trade wind anomalies. This is pretty much one of the primary things I look at. We currently have a westerly anomaly in the far Western Pacific. I would say right now that the probability is higher for El Nino development than La Nina based on the current state of the trades. Bob, thanks for responding. Believe it or not, I know what SOI stands for, what it means, and even that the BOM used it as a way of “predicting” our weather. 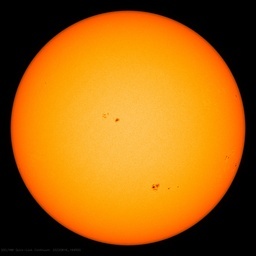 But, you have just reverted to your original answer – it is a metric that we weather gurus use. My question is – why was this metric so meaningful that we had it in our weather forecasts for years? What is it? Why was it made so important? How come, for years, we were told that the “Southern Oscillation Index” was doing this or that by our weather forecasters? And then, suddenly, all that disappeared? Well done, Bob. I raise my glass and slosh my beer in your direction. Also, the NINA3.4 region lies within 5°N to 5°S, 170°W to 120°W. (A 10° equatorial strip aligned roughly with the eastern tip of Russia on the west, Point Conception, California on the east. I don’t see how warm water sloshing around in the Pacific can affect the earth`s temperature as a whole .Redistribute and cause local changes of course but the temperature of the planet as a whole ?? For this heat has to either appear or disappear not just change its locale from one part of the Pacific to another. For years, we’ve had either El Niño or La Niña conditions or were transitioning between them. Recently, we’ve been stuck in ENSO-neutral conditions: not El Niño and not La Niña. Is your question, why are we now in ENSO neutral conditions after years of being in one extreme (El Niño) or the other (La Niña)? The mental link that has not been made explicit here is that, as a pressure index, SOI is intimately connected with the forces that drive geostrophic winds, of which the trades are a component. You’re correct. Mere sloshing of the Pacific basin (a la standing wave) will not change the SSTs at all. That concept should not be confounded with changes in true currents and in upwelling intensity brought about by changes in prevailing winds. Here in Victoria, Australia we have had an unusually windy season in the last 4 months we have almost had constant nor-westers or westerly gales since the end of spring. Cold fronts and lows passing to the south of the continent. (1) During “normal” conditions, the sea surface temperatures in the western tropical Pacific are much warmer than they are in the eastern tropical Pacific. Because there’s so much warm water in the western tropical Pacific, there’s a lot of convection, cloud cover and precipitation there. In fact, that area is one of primary sources of moisture in the atmosphere. “Normal” jet stream locations are impacted by the all of the warm water being located in the western tropical Pacific. During an El Niño, all of that warm water shifts ¼ to almost ½ way around the globe (the width of the tropical Pacific). The jet streams are changed from their “normal” locations. As a result, some places around the globe warm and others cool during an El Niño (without a direct exchange of heat from the tropical Pacific), with more places warming than cooling. (2) During an El Niño, warm surface and subsurface waters from the western tropical Pacific are spread across the surface of the eastern tropical Pacific. With more of the surface of the tropical Pacific covered by the warmer water, the tropical Pacific releases more heat than normal into the atmosphere, primarily through evaporation. As the moist air later condenses into rain, it then heats the atmosphere. Atmospheric circulation carries that heat poleward, where it is discharged to space easier. Before the El Niño, the warm water below the surface of the western tropical Pacific was excluded from the surface temperature record. 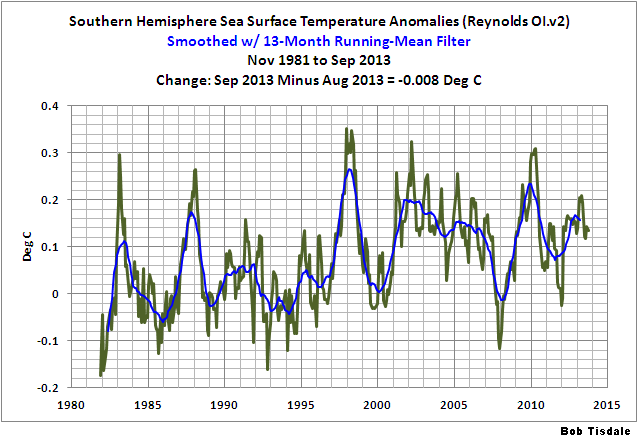 During the El Niño, that warm water is now included in surface temperature record. The El Niño does not consume all of the warm water, so the left over warm waters are distributed around the globe by ocean currents and continue to be included in the surface temperature record. (3) The La Niña that follows an El Niño typically recharges part or all of the warm water released by the El Niño and redistributed in the El Niño’s wake. (And some La Niñas can create more warm water than was released by the El Niño.) The coupled ocean-atmosphere processes that accompany a La Niña accomplish this by reducing cloud cover over the tropical Pacific, which allows more sunlight than normal to enter and warm the tropical Pacific to depth (about 100 meters with most sunlight being absorbed in the top 10 meters). In this respect, ENSO acts as a chaotic, sunlight-fueled recharge (La Niña)-discharge (El Niño) oscillator. Therefore, during multidecadal periods when El Niño events are releasing more heat and more warm water than “normal” from the tropical Pacific, ENSO causes global surface temperatures to warm. They have to warm. On the other side of the coin, during multidecadal periods when there are a lack of El Niño events, the tropical Pacific is releasing less heat and redistributing less warm water than normal, and global surface temperatures warm less—or cool. 1sky1, see my reply to Christopher Korvin above. And as far as I know, there was no La Niña during the 1917/18 season. Crosspatch, I use http://www.bom.gov.au/climate/enso/sst_wind_anom_5day.large.gif the TAO Triton 5day SST and winds. The wind anomaly is a puzzle (what is the baseline?) but does indicate a westerly wind direction change. You seem to be asking a political question, as to why the SOI is not being talked about as much in the media or by government bureaucrats as it has been in the past, rather than a scientific one. That is probably beyond Bob’s area of expertise. I’m curious. What has seeing your phenomenological reply to Christopher Korvin to do with my purely dynamically based remark to him? 1sky1, I must admit I only read as far as the first two sentences of your comment. I should imagine that is due to a cessation of Ekman transport of the Humboldt Current to the surface. It seems Coyne was rated higher for one day, yesterday, so he says “Now I can die happy”. He specified “temporarily”. Wasn’t claiming anything beyond that. Re BoM and SOI. They do address SOI and Nino 3.4 each week via their climate notes. Nino 3.4 is a sea temperature based measurement and is also a geographical area in the eastern south pacific. For a while now it has been given more weight than SOI but as Bob pointed out the measurement of ENSO uses many indicators; but these two are the most important. If BoM is not discussing this with the public its beyond me why. It’s available on the internet by BoM for all to read. Other indicators are addressed as well. I forecast weather for cruising yachts in the SW Pacific and don’t understand one of the comments regarding westerly trade wind anomolies in this area. We have traveling Anticyclones and in conjunction with the semi permanent High just west of south america the Trade winds are created. Between each High there is always an ‘intra-anticyclonic trough’ and often a cold front from a more southerly Low. These produce winds from a westerly quadrant and are transient. This has been the sequence (usually every 7 days give or take) and ‘always’ has been, so I would not refer to it as an anomaly. Now in the northern hemisphere every now and again the Islands from the Marshalls westward also experience westerlies for very brief periods particularly in the northern winter. These don’t last long at all and usually relate to a trough extending toward the equator. ; sort of an analog to that of the southern hemisphere. It dissipates as it heads east usually near the dateline. Thanks Bob Tisdale for your efforts. I do plan on purchasing your book. I hope in it you elaborate more on the so called Westerly bursts affecting the western south pacific during the southern peak summer which are of course from the Huge High in Southern Asia. This is the cause of the ‘Monsoon’ winds and conditions in northern Australia and Islands to the north as these winds cross the equator and turn left thanks to coriolis. This of course creates a tremendous clashing with the SE Trades as I’m sure you know. Bob, thanks again for an interesting post, and commendable patience replying to various comments and questions. I am curious about the “Unisys” Current sea surface temperature anomaly plot as shown in the WUWT ENSO page. Although, as you point out we are currently ENSO neutral, over the last couple of months there seems to have been much more “blue” (ie cold anomaly) areas in the southern ocean than usual. THis is particularly so for the South Atlantic and the southwest Indian Ocean where the Agulhas Current originates and flows down the east coast of Mozambique and South Africa. Any significance to this or is it just another indication, along with increasing Antarctic ice, that the southern hemisphere seems cool (and despite record warmth in Australia in September)? So, as I said, we don’t know. It’s really ok to say “we don’t know” and that is because we don’t. The root cause is out there and as unknown as the feedbacks of CO2. We appear to have a different understanding of the word “know”. Bob, sorry if I was grumpy in my last round of questions. I appreciate the work you do, and your willingness to interact with people about it, very much. It has taught me a lot. My questions arose from the fact that the SOI was used as a proxy for drought conditions for years during the height if the CAGW scare. Now that the dry years are behind us (temporarily – this is Australia) we don’t hear anything about it, when it used to be a feature of every weather forecast on the ABC and many commercial stations. If I understand you correctly, the SOI is a subset, or perhaps an indicator, of what ENSO is doing. At present, things are pretty quiet, so you say that there is nothing to report, hence no reporting. That is fair enough, on its face, and thanks for clarifying it. But, it does make me think that weather reports are much more politicised than many people realise. It would undermine the disaster narrative to admit that the SOI isn’t doing much, so they just deleted it. I fully expect it to return when the next dry spell comes along – provided, of course, that it is doing what they expect it to do. Judy Curry has a thread going about the Australian bushfires, where someone has posted historical data which allegedly demonstrates that El Nino/La Nina events do not necessarily correspond with droughts, and the high temperatures and hot westerly winds that typically accompany major fire events in Australia. I had a look at it, and it seems kosher to me (but I’m no expert and may well be wrong). Anyway, there is a lot to learn about the building blocks of climate, and you are more than doing your bit in that regard. Christopher, have a look at global stratospheric jet streams. All that looping and streaming is being acted on by oceanic/atmospheric teleconnections. So you bet sloshing in one ocean area can affect weather patterns all around the globe. And since those teleconnections have decadal swings, patterns can develop that stick around for a while. dp, I can diagnose what set off a teenage snit. But I can’t predict what will set off the next one. Christopher I also forgot to mention that both cold and warm currents interweave in ocean layers. Sometimes a cold current is forced over the top of a warm one, and sometimes a warm one is forced over the top of a cold one. 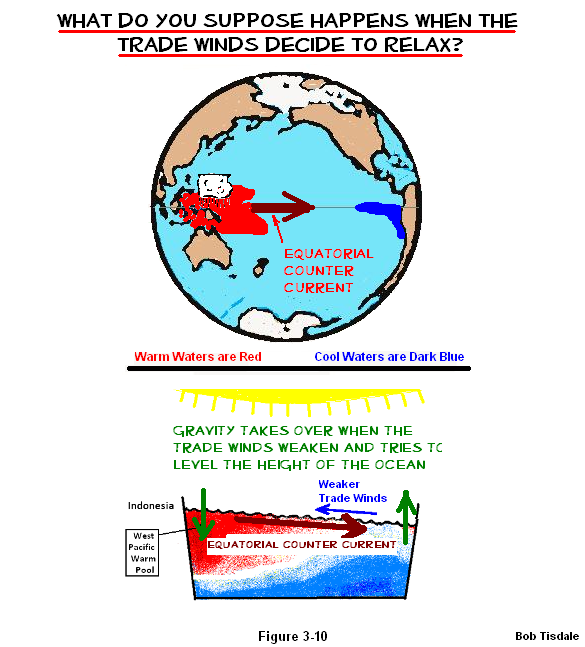 Winds are mostly responsible for this because when the surface waters are calm, currents stay within their normal layered course until they reach a barrier of some kind, which once again forces these currents to fight for position. So yes, the heat can appear and then disappear on the ocean surface in several places. I’ve always been curious as to whether and how warm water has to “slosh” half way round the world from the west to east Pacific, to give the elevated SSTs off Peru in an el Nino. Has anyone ever tried to surf this slosh? 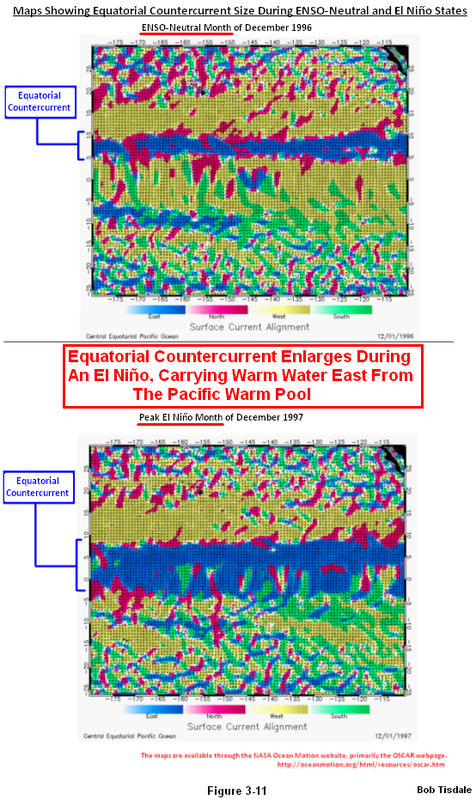 Is it not however also possible that east Pacific warming in el Nino is due to curtailment of normal cold upwelling off Peru. I’m further curious as to why there seems to be some taboo about mentioning the word UPWELLING in relation to ENSO and el Nino.